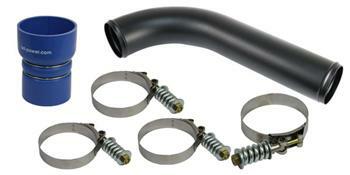 Replaces the weak factory plastic intercooler intake pipe on your truck. Eliminates potential cracking from improved boost pressures that comes with turbo and electronic modifications. Available in a powder coated polished appearance. Upgrade to our Heavy Duty Hose & Clamp kit while your at it!